School budgets are being cut all over the country, and music programs are often first on the chopping block. 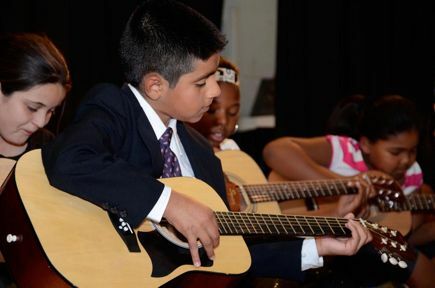 Music is as essential to a well-rounded education as literacy, math, and science. It promotes physical well-being, social understanding, and helps build bridges within local and global communities. What can we do about these cuts? How can we ensure music programs continue in our schools? Music in Schools Today reaches over 51,000 toddlers, children and youth in the San Francisco Bay Area annually with sustainable music education programs that improve student achievement in school and if life. MUST, founded in 1983, provides advocacy and research for music education nationally. MUSTKazoo is a fun and creative way to raise money for music education! Simply record a song on kazoo, donate and tag your friends to do the same! Together we can save music in schools. Are you ready for the challenge? We are! Grab a kazoo, a friend, and your phone or computer and film a video! Once you've uploaded your video, make a donation to the MUSTKazoo Challenge! donations can be as small as $1 and as large as your imagination. 100% of your donation goes toward funding music education in schools in the San Francisco Bay Area and beyond. Next, challenge two more people to do the same! Use the hashtag #MUSTKazoo and #kazoochallenge and send your video out to your friends. challenge them to play their own song on kazoo and donate to the cause themselves. your song could be featured on the MUSTKazoo website and on social media! have fun, go viral, and raise money for music education! THE BOARD OF MUSIC IN SCHOOLS TODAY WILL MATCH YOUR DONATION DOLLAR-FOR-DOLLAR UP TO $100,000! THAT'S TWICE AS MANY KIDS RECEIVING QUALITY MUSIC EDUCATION FROM YOUR MUSTKAZOO DONATION! Just as an orchestra needs different instruments of varying sizes and sounds, so too do we need sponsors of different levels. No matter how small or large, every instrument is needed! Just like the piccolo, supporters at this level set a brilliant and forceful melody for the rest of the orchestra to support. By donating just $1, you are helping to lead the way for the future of music education! Loud and proud! Donate $100 or more and proclaim your support for Music in Schools Today! Striking and intense, sponsors at the Trumpet Level lead the charge for support of music education. Show your continuing support for music education by donating at the Violin Level. Donations of $500 dollars or more are the backbone of our funding! Deepen your commitment to music education by donating $1000! The bassoon is active and penetrating, as are the donations in this level of sponsorship. Your gift actively drives music education and enrichment in our schools! Stately and sustaining, just like the cello, supporters giving $2500 dollars or more maintains Music in Schools Today throughout the year and exemplifies the passion of our sponsors. Majestic and weighty, like the sound of a tuba, supporters at the $5000 level are setting the tone for us all! The dedication and support from this sponsorship level resonate throughout the entire MUSTKazoo challenge. Thank you! Special thanks to the MUSTKazoo Krew! Music in Schools Today is a non-profit organization that supports and develops music education programs that increase student achievement.